Very much a WWE in-product, written by their staff and starring one of their wrestlers, it would be easy to dismiss this story of a murdering psychopath as nothing more than slasher-trash. But given the chance to play out in its entirety, See No Evil, while not a diamond in the rough, is perhaps a nice quartz in the mud. The film's tale is simple. A cop busts in on an eye-plucking killer, shoots him in the head, and loses an arm for his trouble. Flash forward several years, and this grizzled cop is now taking a group of young, promiscuous convicts out on a work detail to renovate the run-down Blackwell Hotel. And lo and behold, the hotel is secret home of the not-quite-dead killer from that previous encounter. Cue murder, mayhem, mutilation, and a dash of shower voyeurism. A simple formula that plays out quite well in its simplicity. However, at a running time of a mere eighty-three minutes, See No Evil's dreadful pacing is a serious problem. The opening sequence does an excellent job of establishing our killer, Jacob Goodnight, with a shadowy axe attack and the vicious gore of dismemberment. With the disjointed religious music in the soundtrack, not to mention the crucifixes and other iconography that decorate this initial setting, we as an audience get exactly the right feel for this twisted killer, and indeed the film as a whole. After this initial shock , however, we launch into the long and dreadfully slow paced exposition, establishing the convicts and their cardboard personalities. Despite the length amount time we spend getting to know them, this overly long set-up fails to engender any sense of identification or empathy with the characters. They just aren't that interesting. The meat of the film, the stalking and killing by our eye-obsessed, sin-punishing monster, comes almost too late. Once Jacob asserts his presence in the hotel, however, the film settles itself into a nice steady rhythm of gore and violence. A slasher film either succeeds or fails on the basis of creating a compelling killer, since our cast of convicts are all, inevitably, dispensable. Jacob Goodnight, as portrayed by Glen Jacobs (credited under his WWE persona Kane), spends a little too much time being a generic killer before we really delve into the intricacy of the character. A seven foot man with an axe is certainly a terrifying prospect, but when seen in the all-too-short glimpses that the director provides, we get no sense of scale or individuality. The meathook on a chain weapon that features later is so cartoonish in its use that it is too comedic to be frightening. We seriously know nothing about why Jacob does what he does for too long. That said, when we finally delve into Jacob's history , it is beautifully rendered in intercut flashbacks, depicting the horrible treatment Jacob received as a child from an overbearing, enslaving mother. We see Jacob's psychological damage as it happens, from religious indoctrination to total sexual repression. These flashbacks weave well into the narrative of the tale playing out on the screen, juxtaposing Jacob's treatment of his favorite victim with the treatment he received from his mother. While this backstory is neither innovative nor original, it is still compelling enough for what the film requires. Jacob's character owes a lot not only to Jason Voorhees of Friday the 13th fame, but to Norman Bates as well. While equating See No Evil with Hitchcock's Psycho may be like comparing a McDonald's hamburger to a Kobe steak, nonetheless See No Evil is a Psycho for the ADHD generation. The 'peeping tom' scenes, the sexual repression of the killer, the hotel setting – all the parallels are all there. But instead of the cool, calculated stylings of Hitchcock, we have frenetic editing and oh-so-trendy desaturated colors. 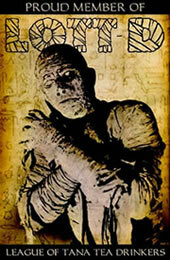 Rather than a careful glimpse into a shattered mind, we are shown a paint-by-numbers twisted monster. Every bit of Jacob's character is given to us in these broad, simple flashbacks, so that even the most scatterbrained audience member can understand why he is a killer. The saddest part of See No Evil is the lack of moments that evoke real fear. There is gore and violence aplenty, but the film spends too much time going from gross out to gross out. Yes, getting impaled or gutted is a scary concept, but it lacks the psychological element of a true scare. It doesn't niggle at the back of your head or set your teeth on edge and your heart thumping. Mostly, the film offers little more more than a single jump before moving on. Thankfully, we do get a few really terrifying moments. Seeing Jacob rock back and forth, his arms cradled around a still-breathing victim, while a child chorus rendition of 'Jesus Loves the Little Children' plays from a dusty boom box is deliciously disturbing. This moment, though, is almost lost in the sea of violent imagery that surrounds it. 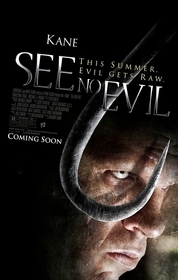 See No Evil is not attempting to scare it's viewers at anything beyond the most basic level. It is an unadulterated killing spree, a gleeful gorefest for the edification of the audience. We ask not for high art, and we receive it not. When looking for what truly stands out in this film, it is the set, more than any other film element, that springs to mind. The Blackwell Hotel is wonderfully realized, from the period art to the dust smeared walls. Jacob's sanctum is See No Evil's highlight, with its unique wall decorations, the trophy jars, and the twisted cages. Everything comes together. The blood smeared wallpaper, the harsh, yet all too sparse fluorescent lighting – it all combines into an almost allegory of our killer. They are relics, both run down and rotten inside. The hotel provides a subtle glimpse into Jacob's insanity that is otherwise so blatant and harsh through the other aspects of the film. In the end, See No Evil is not an original film, but a formula played to its strengths and not caring about its weaknesses. It entertains, but no more nor less than any other average slasher film. A treat if you want a great setting, but otherwise, a title best left to the wrestling fans for whom this film was made.